Why is the 2007 Vintage Port special? Why is the 2007 Vintage special? A Vintage Port declaration is always special, partly because declarations only occur occasionally and also because each declared vintage is unique. 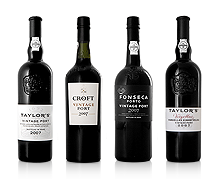 Historically the top Vintage Port houses like Taylor’s, Fonseca and Croft have only declared on average about three vintages a decade. There have often been gaps of five years or more between declarations, such as between 1985 and 1992 in the case of Taylor and Fonseca. The decision to declare a year – in other words to announce it to be exceptional and to release it as a classic Vintage Port – is not taken lightly. The top Port Houses will not declare a year unless they are convinced of the wine’s quality and capacity to age. Because of the effect of climate on the vineyards and on each of the many individual grape varieties used to make Port, no two years produce Vintage Ports which are exactly alike. Whenever a new Vintage is declared, Port shippers are often asked which previously declared year the new vintage resembles. Although very general comparisons can be made, these are not usually very helpful as each Vintage is unique. What made the 2007 Vintage special was the effect of the very specific climate conditions leading up to the harvest. The 2007 growing season was preceded by a particularly wet winter. This rainfall helped replenish the water reserves in the Douro Valley which had been depleted by several hot and dry years. The rainy conditions continued into spring and early summer both of which were unusually cool. Unlike the previous four years, there were no periods of intense heat until early September. As a result the ripening of the grapes was very gradual and balanced and the leaf canopies were free of the heat damage that can sometimes occur in hotter years. The first two weeks of September saw maximum daily temperatures of between 35° and 38°C throughout the Douro Valley. This brought the crop to full maturity, advancing the production of sugar and phenolics while retaining the excellent natural acidity and fresh fruit flavour derived from the relatively cool summer. As a result the harvest produced stylish and elegant wines full of vitality, with a superb vibrant and focused fruit flavour. One of the characteristics of 2007 was that all the grape varieties produced good results, unlike some years which favour some varieties over others. This had two results. Firstly, the wines are beautifully balanced and harmonious. Secondly, each individual vineyard expressed its unique character to the full. As a result each firm’s 2007 is a wonderful expression of house style, Taylor displaying its characteristic elegance, poise and restrained power, Fonseca its abundance of opulent fruit, Croft its exotic aromas and round luscious palate and Vargellas Vinha Velha its extraordinary multidimensional complexity. If ever there was a year to lay down a few bottles of wine from each house, it is 2007.